This is the cover of the Greenfield Historical Society’s new book “McClain High School: A Century of Tradition”. 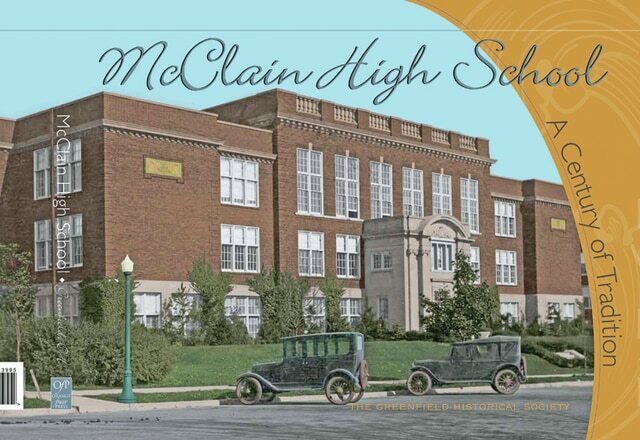 For 100 years, McClain High School has stood as the proud centerpiece of Greenfield and now the Greenfield Historical Society is releasing new book called “McClain High School: A Century of Tradition”. It will be on sale during the Communitywide Yard Sale this weekend in Greenfield and throughout the summer. On Saturday, it will be on sale at the Grain & Hay building, 23 Jefferson St., from 8 a.m. to 3 p.m.
On Sunday, a reception will be held at The Travellers Rest at 103 S. McArthur Way to meet and greet the committee responsible for the book from 1-4 p.m. Through the rest of the summer the book will be on sale Thursdays from 1-4 p.m. at Travellers Rest; during the Green Countrie Towne Festival in July; and during the McClain High School rededication festivities on Labor Day weekend. The committee says this inside the book’s back cover: “The Greenfield Historical Society set about to commemorate the 100th anniversary of McClain High School in early 2014. Even with an extensive file of McClain memorabilia in its archives, much was still unknown. Research led members of the book committee on expeditions through the school’s basement, back closets and roof terraces. The digging and searching proved fruitful as boxes of long-forgotten files, communications and photographs were unearthed, broadening the story of the school’s history and adding new and insightful layers to what was previously known. The book committee, chaired by Harold and Judy Schmidt, consisted of Shirley Shields, Patricia Smith, Susan Thompson and Jayne Honnold. Inside the book’s front cover are these words: “It’s almost a fairy tale, the story of McClain High School. Edward Lee McClain, the benefactor, rises from a working class boy in a harness shop to become a successful entrepreneur who amasses great wealth. As he reaches the stage of his life where he begins to ponder his legacy, he expresses to friends that he would like to leave something in his beloved Greenfield that will serve residents for generations to come. “With this noble goal in mind and the means to achieve that goal, McClain begins building a school – one that he would give to his hometown, one that would be inviting, modern and comfortable to students. He works with the most noted school architect in the country to build a school that would become a model for others nationwide. “With the culmination of the high school project, the fairy tale continues. McClain decides that the youth of Greenfield need more vocational training options, and reunites with his architect to add a vocational building which would also be a premier model nationally. The gifts keep coming. An athletic field, custodial cottages and a bus garage are additional gifts of McClain, given through the next decade.